Basically, over the weekend prior to the biopsy appointment, I had completely rationalized all of my concerns from the week before. I was confident I did not have cancer. I’m young. I feel good. I just nursed two babies. We don’t have a family history. Etc. 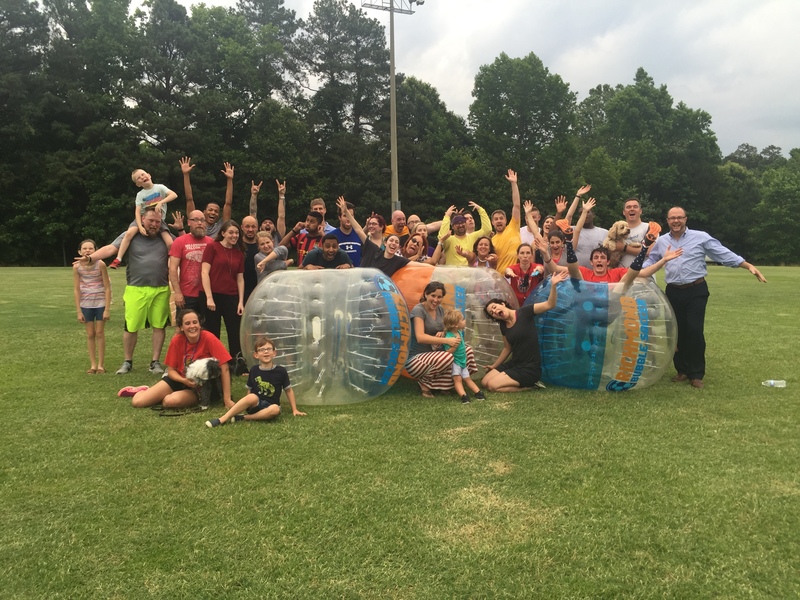 On Tuesday night (after Monday’s biopsy) I got to help organize an after-work bubble soccer game. It was so much fun. I couldn’t actually play–I needed to protect the little wound–but I had a great time with these crazy clowns. So the next day, Wednesday, my friend Christy met me at my biopsy results appointment at 3:15. We had plans to go get beers afterwards. Because, again, I’d convinced myself we were just doing due diligence to confirm everything is fine. If anything, I saw the appointment as part of a routine for responsible people. The nurse led us to a small office with a little couch. We sat down and had a minute or two by ourselves. I joked about how “this feels like a lot of pomp and circumstance.” Don’t ya think? The doctor came in and immediately went over to Christy. He said he needed to check the biopsy site. We giggled a little bit. “Oh, I’m the patient,” I said. I showed him the site. Okay, looks good, no hematoma. He seemed very nice. Then he sat down. So did the nurse. He told me that they had looked at the results, and it was indeed breast cancer. Christy looked at me. I looked at the doctor. “Okay. I didn’t think that’s what you were going to say,” I said. He explained they were still working to identify the actual type of breast cancer, because as of today there are about 300 different kinds. Once we know more about the type, and review other information about how my body would respond to different treatments, I’d work with a medical team to decide the best course of action. I asked how it happened. “Was it too much coffee?” I joked. He insisted it was nothing I did. After the appointment I called Bryce and told him the news. He was shocked too. Then Christy and I went to tell my parents. More shock. But quickly, my dad and I started making inappropriate jokes. Clearly, dark humor as a coping mechanism is genetic. My parents reminded me that my aunt who lives in Austin is a crazy-good pathologist, and I should definitely get her in the loop. Yes! Of course! I called my aunt later that night, and she was all about being my wing-woman. She wanted to read the path labs, see the slides, all of that good stuff. This encouraged me a lot, not in a I-don’t-trust-my-local-medical-team way, but in a way of feeling extra cared-for. My aunt is a baller who shoots straight. I knew she could help me identify questions to ask, give me a head’s up about crazy things to be prepared for, and talk to me about hangin’ tough. On Thursday morning, I contacted a few people from work to let them know the situation. I told them I needed to schedule some appointments and get some ducks in a row before I came into the office. Soon after I sent my email, our CEO, HR Manager, and Director of Content Production got together and called me back. They recommended I stay home for the rest of the week and (somewhat forcefully) offered to take things off my plate. That ended up being a good plan because I spent a lot of time on a phone that day and a lot of time crying. On Friday morning the radiologist sent my aunt all the reports that have been completed so far. On Saturday I got an MRI. I’ll have to write more about that later because it felt like a comedy of errors inside a tiny tunnel. Today the elders at our church got together and prayed with Bryce and me according to James 5: 13-18. Is anyone among you suffering? Let him pray. Is anyone cheerful? Let him sing praise. Is anyone among you sick? Let him call for the elders of the church, and let them pray over him, anointing him with oil in the name of the Lord. And the prayer of faith will save the one who is sick, and the Lord will raise him up. And if he has committed sins, he will be forgiven. Therefore, confess your sins to one another and pray for one another, that you may be healed. The prayer of a righteous person has great power as it is working. Elijah was a man with a nature like ours, and he prayed fervently that it might not rain, and for three years and six months it did not rain on the earth. Then he prayed again, and heaven gave rain, and the earth bore its fruit. I cannot tell you how encouraging that was. Maybe one day soon I will try. On Wednesday, June 29 I’ll meet with the surgeon. That’s when it will start getting really real. Sometimes when I think about it, I feel like a giant force field is pressing on my chest, or like fear is turning me into a wisp, a leaf blown about by the wind. I want to thank everyone who has prayed on our behalf, shared thoughtful words, brought us food, listened to my oversharing, watched the boys, and worked a little extra so I could stay home and process. When I’ve been on the other side of something like this I haven’t always known what to do or say–and so a lot of times I just didn’t do or say anything. Thanks for your boldness and kindness. Jokes and cute Instagrams aside, we are quite needy and scared. Your prayers and tangible graces are like little lifeboats slipped underneath us so we don’t have to tread water so hard anymore. Lizzie, you are going to get through this with more support than you could ever hope for. You are a positive force, and when you don’t feel brave, we will be there to hold onto. Thank you, Ann! Hope you’re doing well! Liz, we’re praying for you. Ann and Steve, thank you. My heart aches for you. You have your own trials ahead, Liz. Wishing you well this week. Elizabeth, I know you through my Daughter Linda Tallman and Facebook. I am a survivor of breast cancer now for 36 years You caught it early, good news. I waited 3 years or so while the docs watched it grow. There are many new procedures and medicines out now. In God’s hands you will be fine with a positive attidude. I never looked back at what caused it. I pressed on with life and thank God every day I’m still here. We love you, little neighbor. Our prayers are with you and yours. Thanks, Connie and Jimmy! Hope you guys are doing well. Liz, God’s grace surrounds you. Prayers daily for you, your 3 young men & your doctors. You’ve got this. Love & hugs from our family to yours. Thank you, Sandy! Hugs right back!